While drinking when we feel like it is a good guideline for adults, don’t wait for your child to speak up about being thirsty! It’s important to offer plenty of water and hydrating foods throughout the day to stay ahead of the dehydration monster, which can bring about symptoms like dizziness, fatigue, and headaches. Water does far more than slake thirst, more importantly, it is a cooling mechanism. It transports fluids and nutrients, helps with digestion, helps with cognitive function and maintains a healthy weight. When a child is dehydrated, the fluid and salt balances in his body are out of whack, and proper nutrients and fluids can’t get to his tissues. And on hot summer days, it can happen quickly if the moisture lost by sweating isn’t replenished. For children who may not be able to communicate their thirst, monitoring water intake and boosting good drinking habits is vital for healthy summer fun. 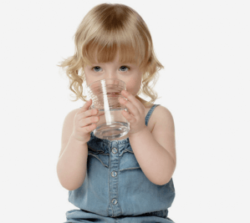 As a rule of thumb, children should drink at least six cups of water a day. Let your kids pick out their own drinking cups or travel bottles in their favorite colors or decorated with their favorite characters. Buy a set of crazy straws. Invest in ice cube trays that make ice in fun shapes. If kids balk at drinking “boring” water, give it some flavor and color. Freeze berries or cranberries into ice cubes, or infuse water with fresh fruit, herbs or vegetables such as lemon, mint, watermelon or orange. Even adding unflavored soda to water makes it more of a treat – bubbles without the calories. Make sure water is easily accessible for little ones. If they can’t reach the sink or the water tap in your refrigerator, set up an easy-to-use water dispenser and a few cups in a place where they can reach it.